So after years of waiting.. (aka,WEEKS) Mr. Postman finally delivered Mr. Fisto. 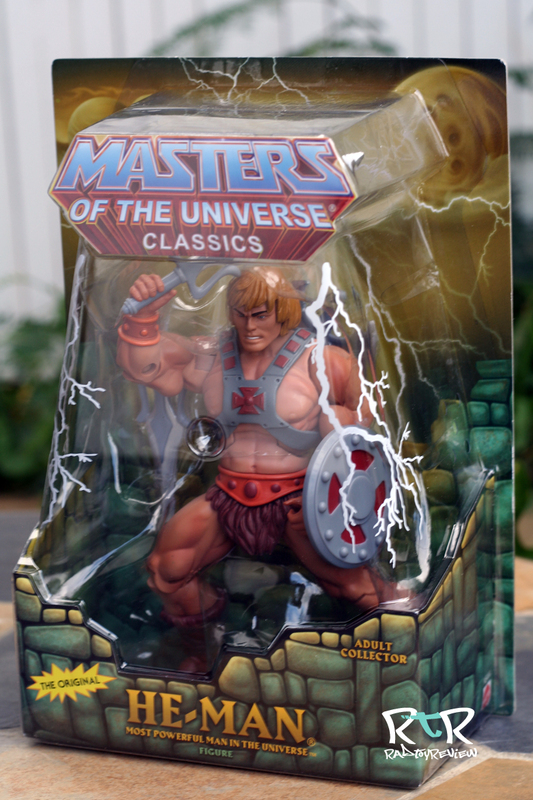 Being a newbie to collecting the “newish” Masters of the Universe Classics line I feel like I hit the jackpot with my timing. 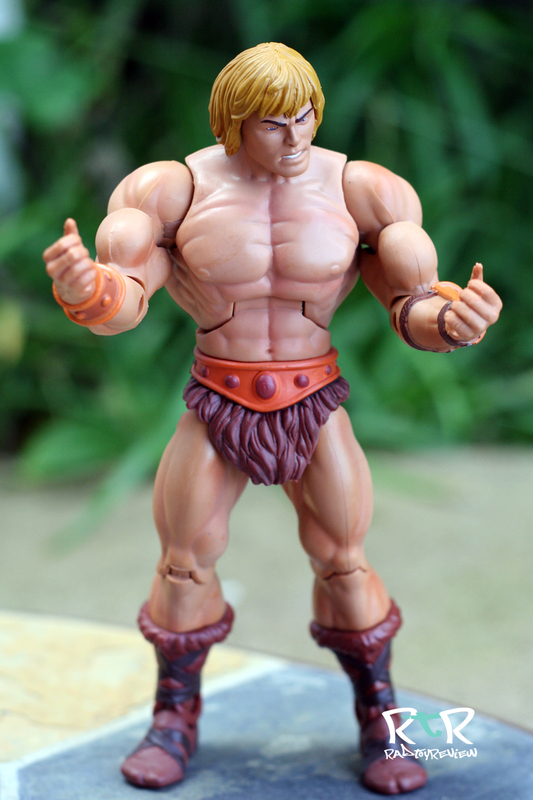 I had just ordered He-Man (review here) and Battle Cat when I saw that Fisto’s scheduled drop day was a few short days away. 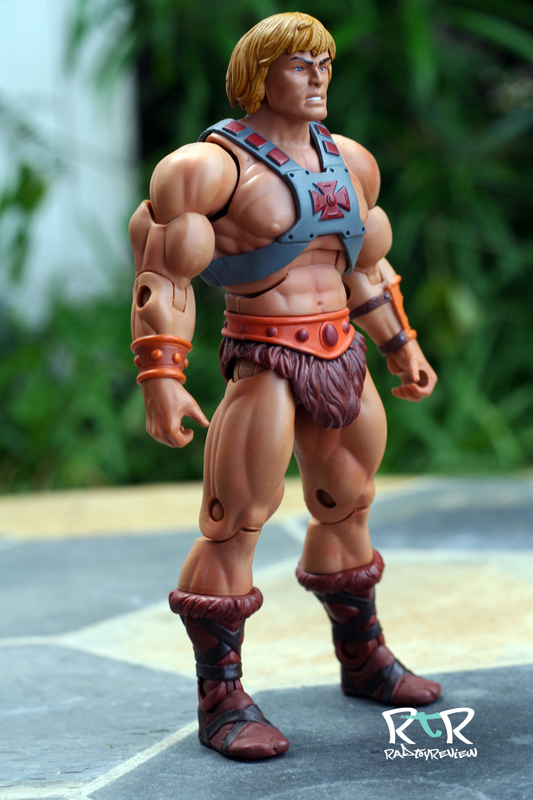 As a kid, Fisto was my favorite MotU character so I didn’t hesitate to mark my calendar and set my many alarms. For me, the drop rang in at 6:00am, not a relatively early time but early enough to be annoying to have to function on a level higher than a heavily sedated Malamute. My iPhone was in hand at 5.57. By 5:59 I was in a Mattel sanctioned waiting room. 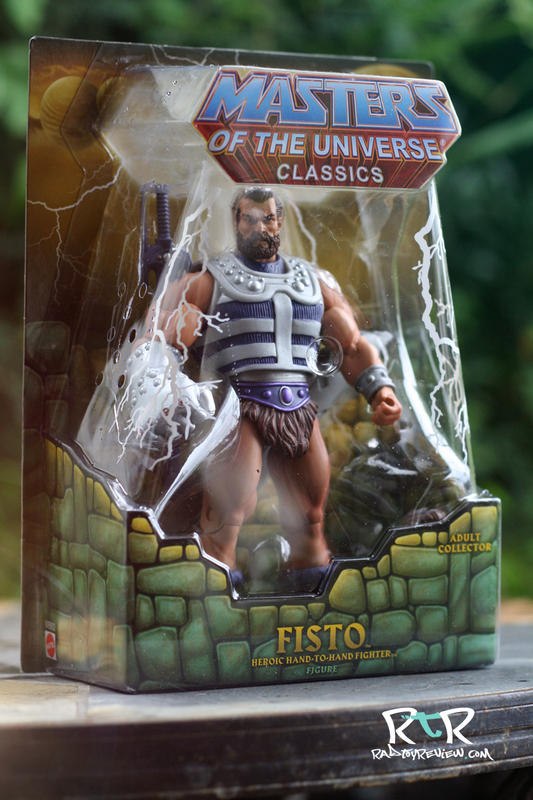 Fisto was in my cart and purchased by 6:15 and soon I was back to dreaming of unicorns and gummy bears. My first mattycollector.com preorder was a success. I thought it was a pretty painless affair though following up on their forums I found that quite a few people begrudgingly missed out on him. I received a notice he was shipping the very next day on Feb 16th . Ages have passed (seriously, are they sending these out via colicing horse and buggy?) and he’s finally here. So now the cliche’ question I hope to answer, was he worth the wait? 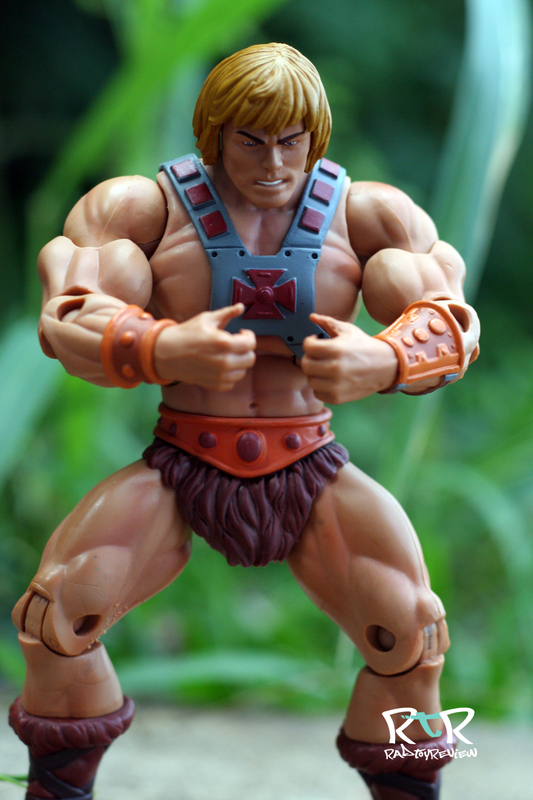 Fisto came in the same style pack as He-Man did. Classic Masters of the Universe logo splashed on a bubble topped card. I like the way these look as they’re a nice call back to the days of years past, but bubble cards in general are something I’m always at odds with. I much prefer a box style pack or even sliding bubble packs where you can cut a few thin pieces of tape that allow you to easily slide the bubble off without destroying the card. It’s the never ending conundrum for the toy collector. I just don’t think it has to be that way. 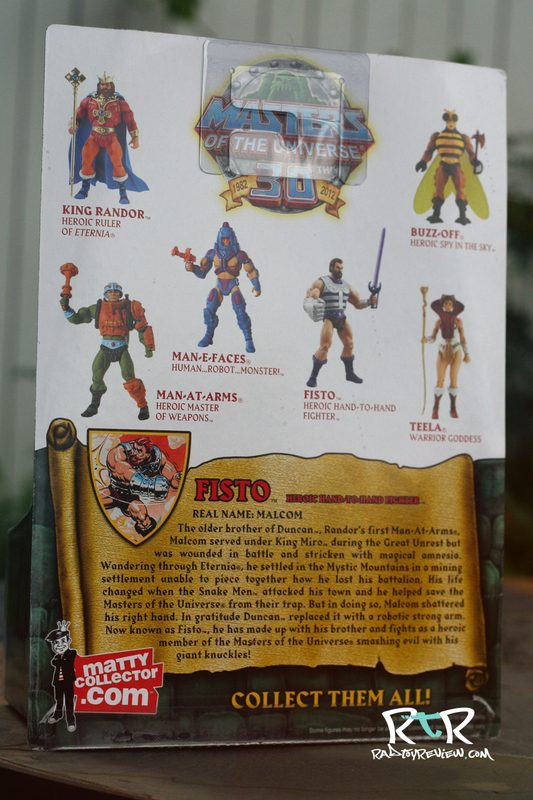 The back shows some other figures to put on your “want list” and of course, Fisto’s backstory. I love that the story art is a throwback to the old school comics that used to come packed in with the original figures. I wish they still did that, it’d be awesome to have a mini series continuing the saga. I’m sure printing cost is a huge factor in why they don’t. 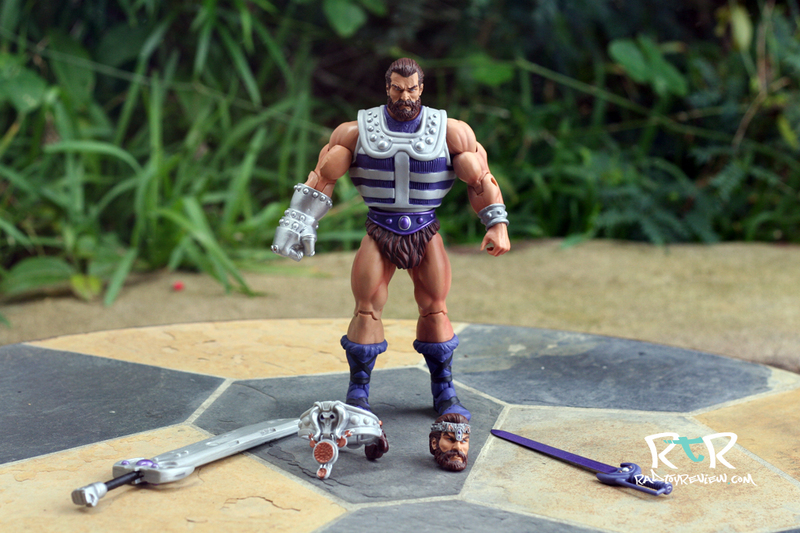 When I was a kid, I’d almost always misplace the extra accessory that my toys came with. I’m happy to report that Fisto comes with plenty of extra things to lose. 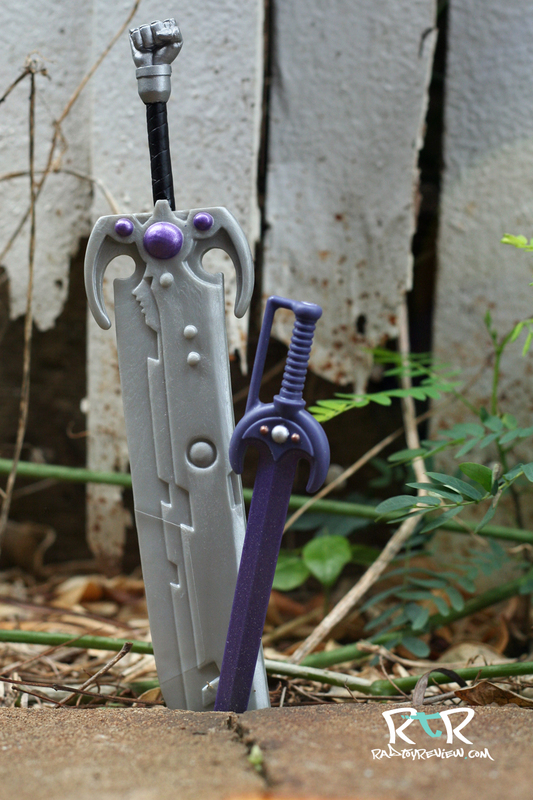 You get a removable belt, a purple sword that just like the original toy of old, is the same sword that comes with Tri-clops, an extra MASSIVE sword from an older unreleased prototype and an extra crown bearing head. Man, Fisto rocks. In what could have been the shortest review ever, I’ll go ahead and expound on that statement. Right off, I’m blown away by the fantastic sculpt (courtesy of the ever impressive Four Horsemen). 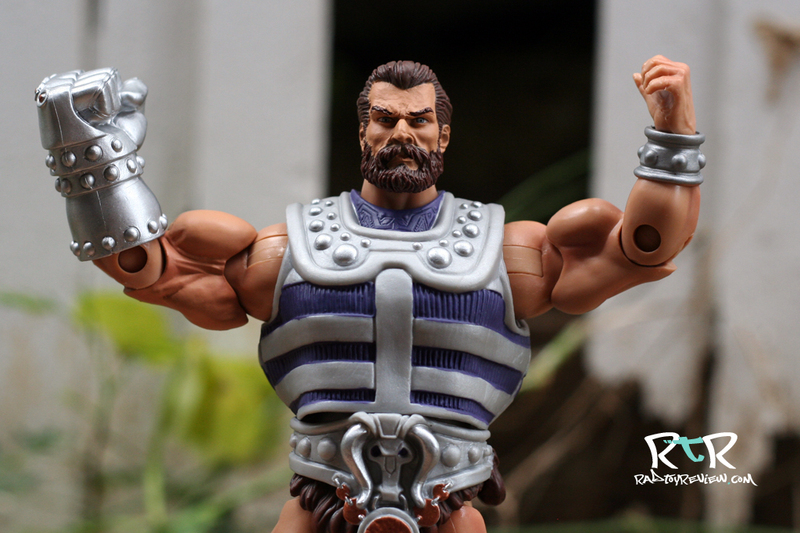 Fisto looks grizzled, but not haggard, ready to fight, but not menacing. The details in his beard and face such as the frown lines between his eyes are spot on. 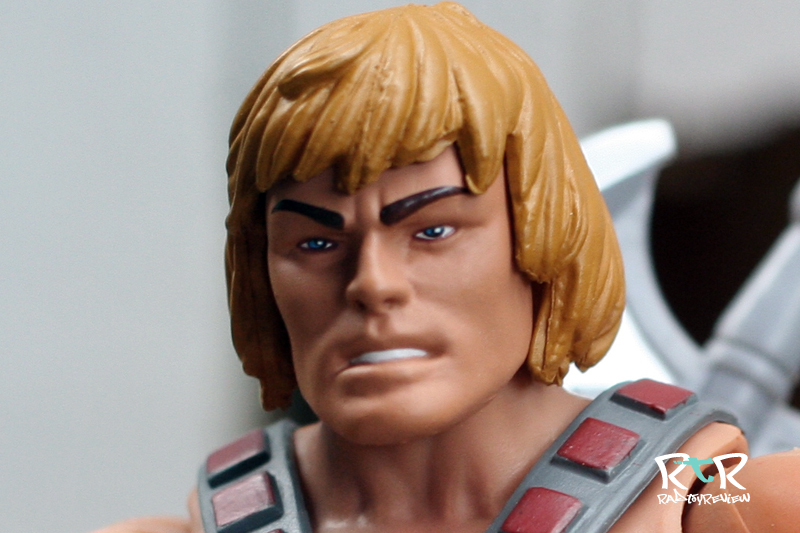 While I liked the way He-Man turned out, Fisto’s face came out a lot more realistic and believable. 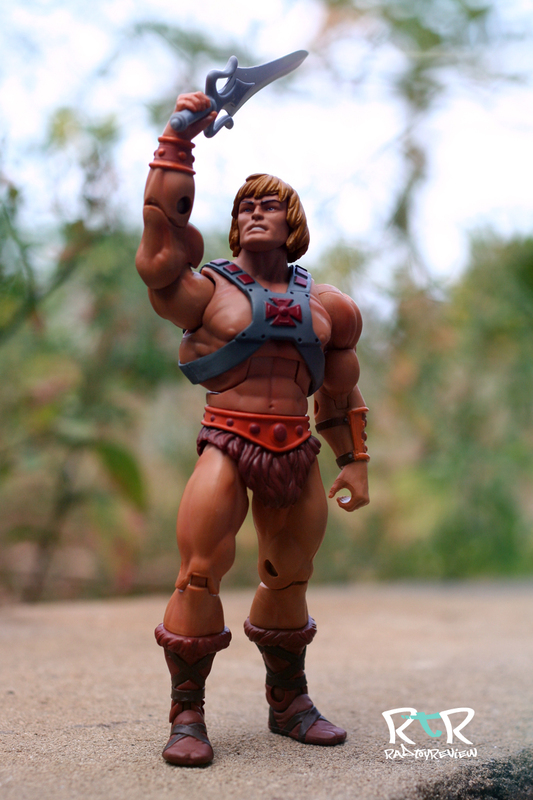 I’m pretty sure I’ve even seen someone somewhere who looks like just like him, sans giant metal fist. One of the cool details that some may not notice right away is that his right bicep is actually sculpted larger than his left. There’s even a bulging vein to accentuate the strength and effort it takes for him to swing that ginormous steel fist around. Speaking of the fist, it looks perfect. 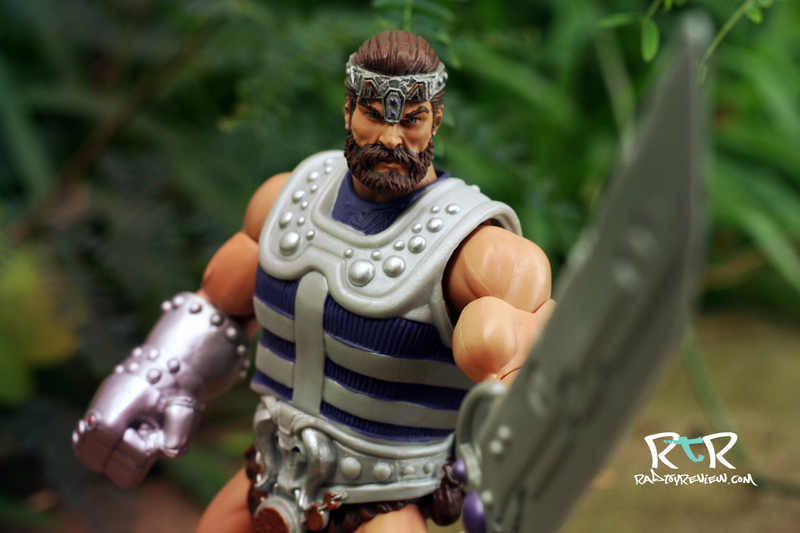 A few gold accent colors on the knuckles break up the silver nicely and of course the sculpt is impeccable. 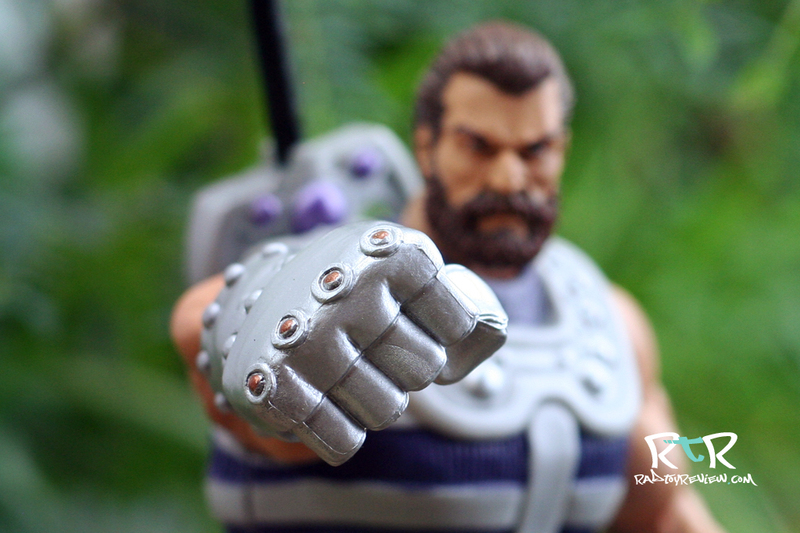 I used to pop the old Fisto’s fist off and pretend he could shoot it at bad guys like Thor throwing his hammer, but I’m not sure that’s possible here. I’m not doing very much “pretending to shoot at bad guys” these days, plus I didn’t want to risk breaking my shiny new toy so I can’t verify this one way or the other. Side note: It’s amazing how easy it is for one to at once make claims of maturity and then completely disintegrate said claim in the same sentence. Moving on. You get a bunch of options with Fisto in how you want to display him. 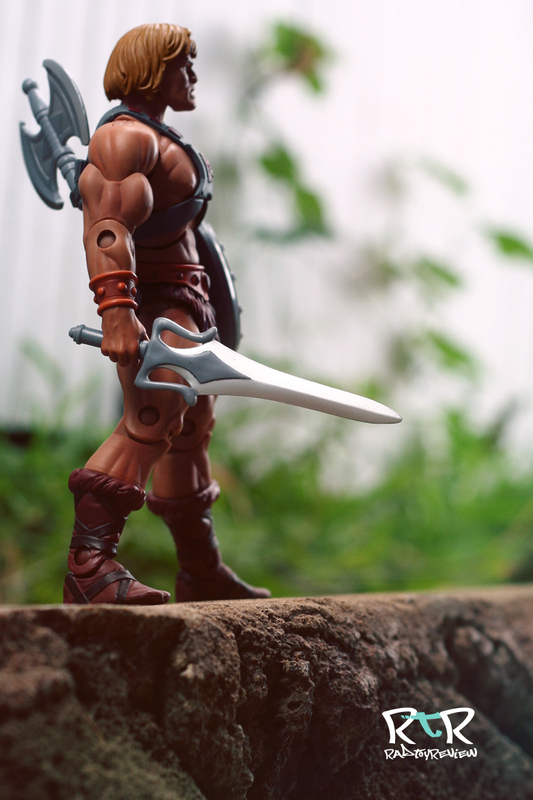 My favorite way being with his giant sword sheathed in the molded loop on his back, while he holds the smaller sword in his hand. Throw the very nicely detailed belt on and he’s ready to go. The most obvious change is a quick swap of the heads. While both heads share several of the same deets, I’d give the edge to the original. The crown looks cool on the secondary, but the paint on his face looks a little bit flat compared to the first. Personal preference here definitely applies. 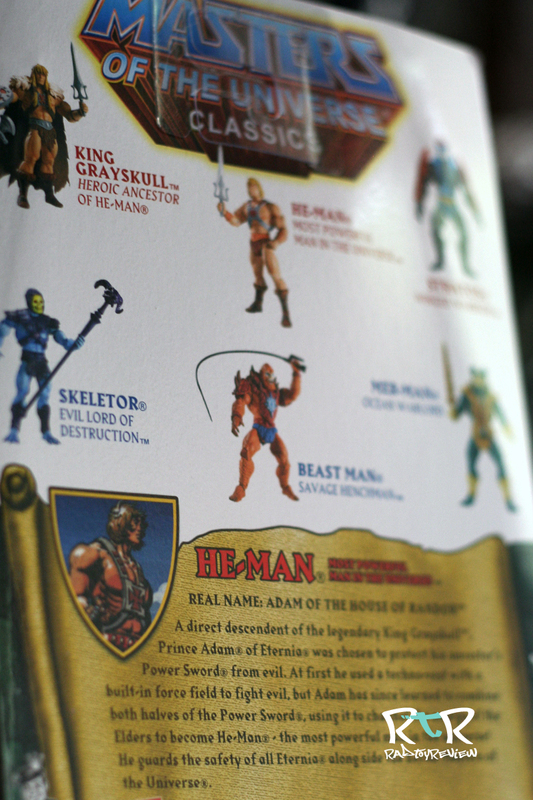 Fisto is just as articulated as He-Man was and also shares the same limitations I mentioned in that review. 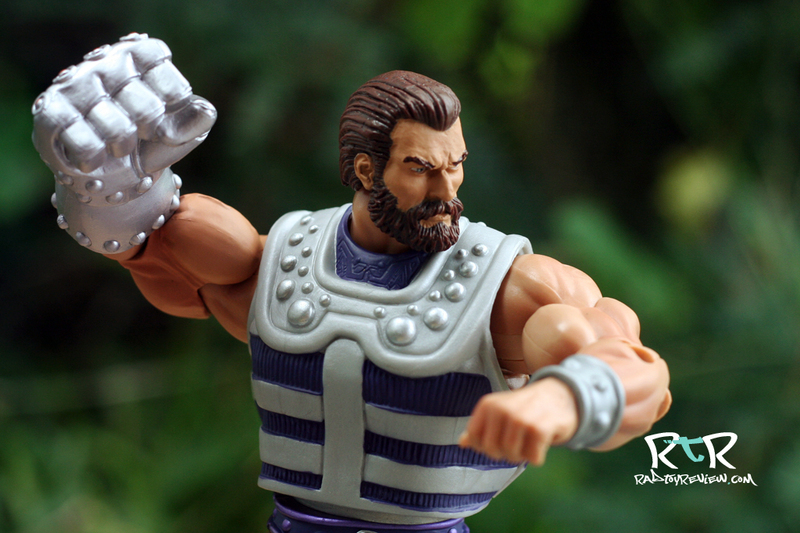 The only real difference being his massive fist which pivots at his forearm. You get a pretty good range of motion out of him overall. His vest piece, when combined with the belt does limit some of his waist/torso articulation. It’s nothing terrible, but it does prevent his full range of motion. I think one of my favorite details on Fisto is actually on his belt. 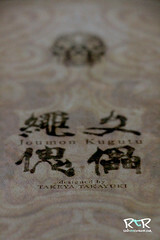 On the back of it is a small book and pouch. 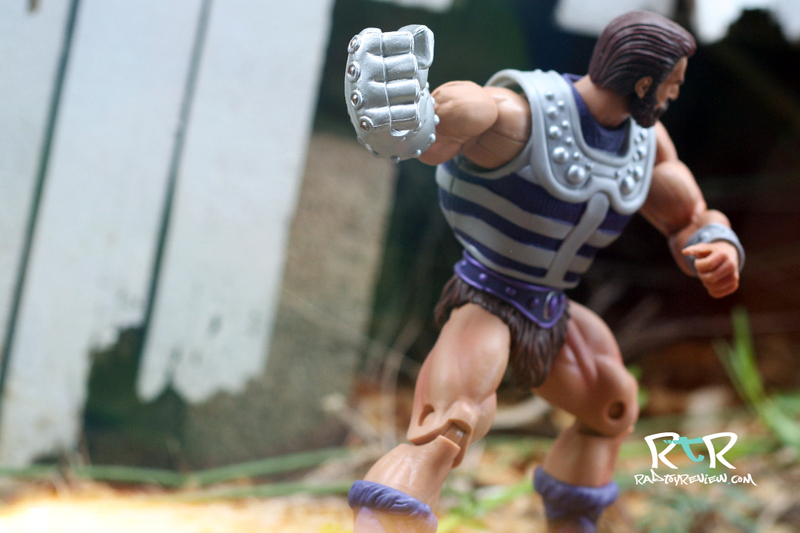 They are not removable, but add so much character to the figure. Seeing them had me wondering what they were all about. Does Fisto keep a diary? It’s kind of a shame they’re on his back, because there’s nothing aesthetically pleasing about the big flat circular fastener they’re next to. 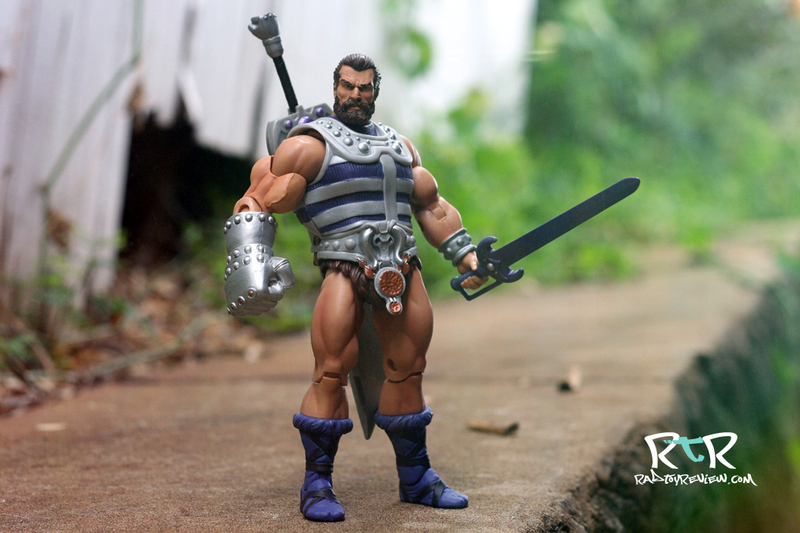 In the picture above you might notice that giant sheath/loop that you use to hold Fisto’s massive sword. While I think it’s a great feature, I wish they would have figured out a way to also allow for the smaller sword to be held there as well. Like the extra head, if you decide you’d like to have him holding the Cloud Strifian blade, you basically have to find some place to store it. You can sort of hook the hilt of the purple blade on the edge of the loop, but it doesn’t hold up to much posing or when viewing it from the back. Sit and forget and it’s a serviceable solution. 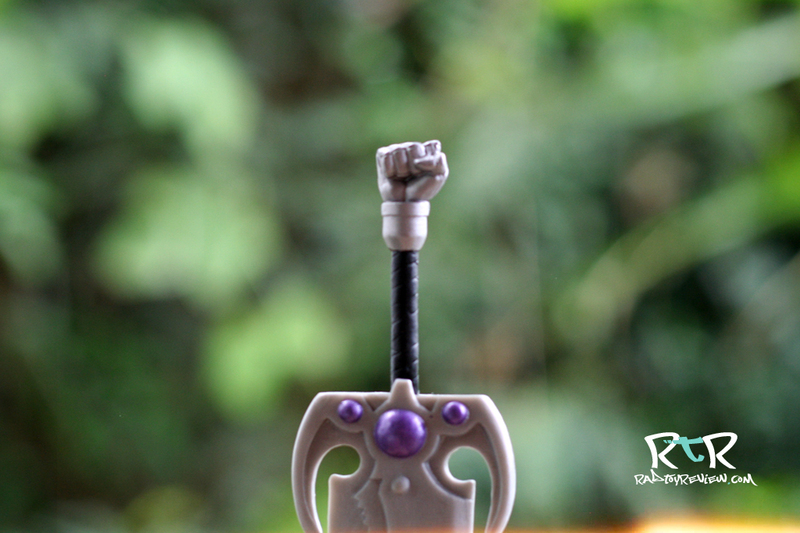 Another really cool touch is the tiny iron fist sculpted on the end of the massive sword’s hilt. The sword itself is a little too anime for my taste, but sheathed with that fist sticking up in the air is straight up beast. 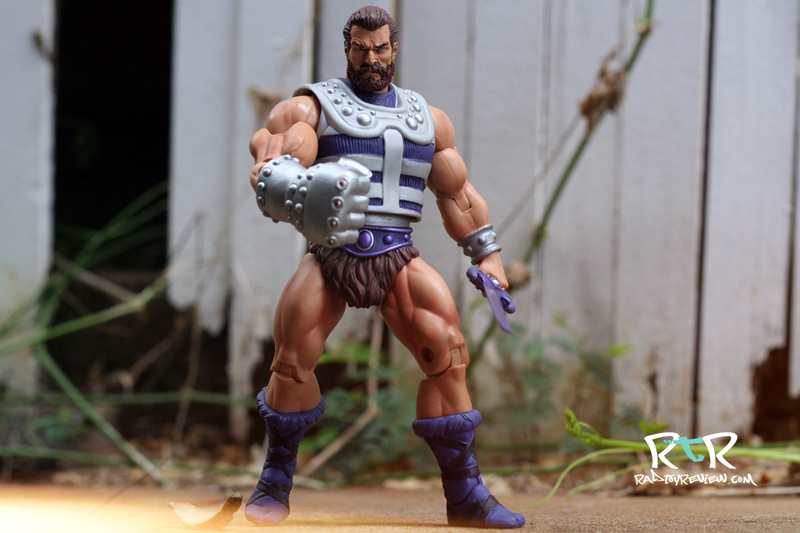 Overall, the paint application on Fisto is really superb. 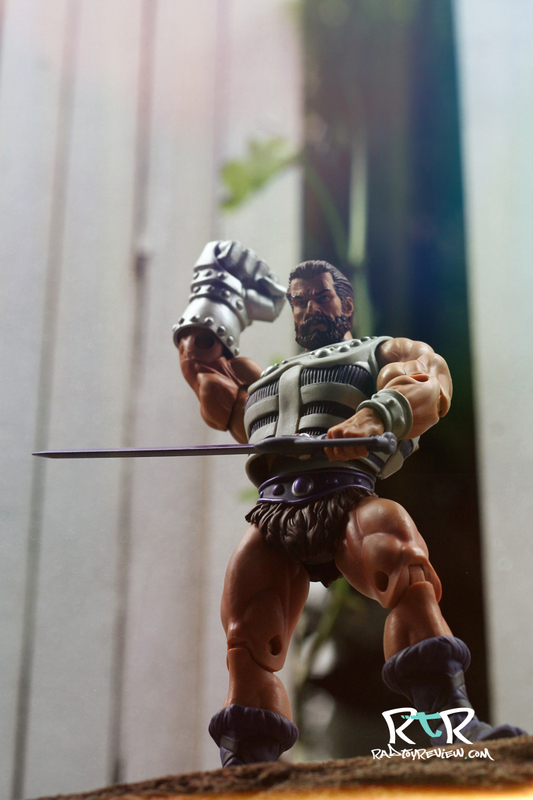 Small details abound on his face, armor, fist, belt, swords.. the subtle goodness is everywhere. 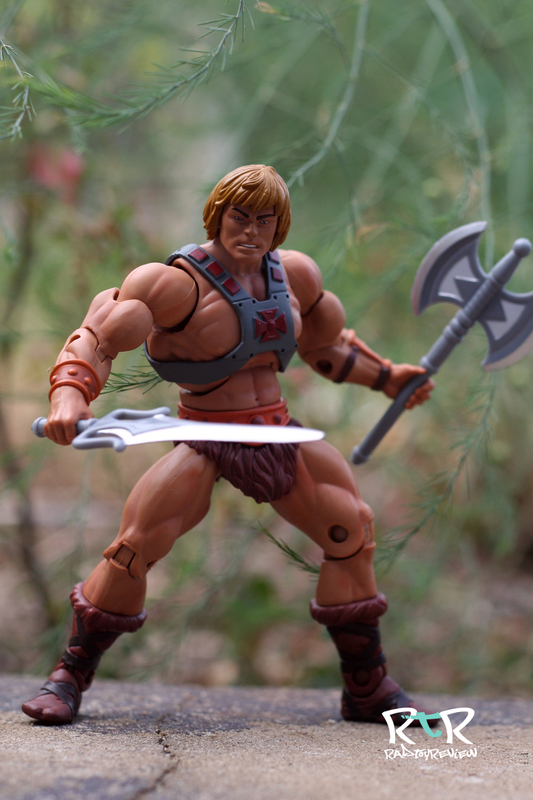 Like He-Man, the shading on the skin gradates to support the sculpted form beneath. 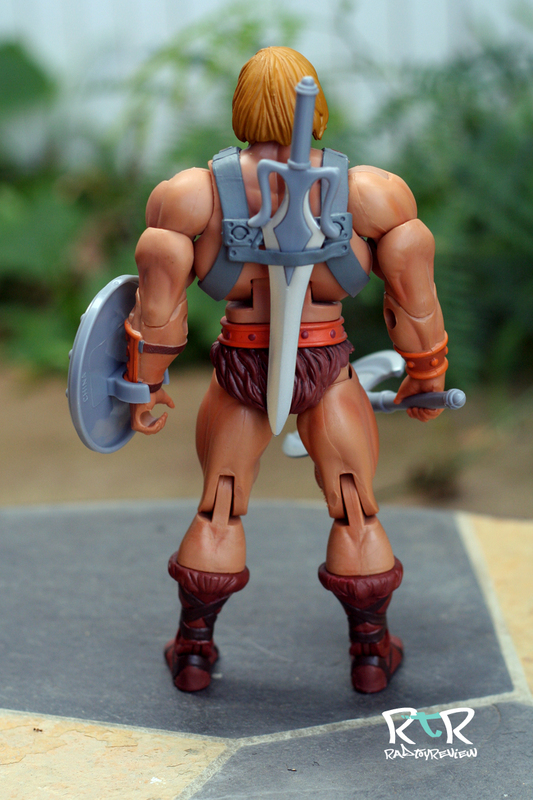 I really like that Mattel doesn’t just give us flat “muscle bound” plastic and call it a day. They do seem to care how these toys are made. Alas, as with all things in life, Fisto is not perfect. 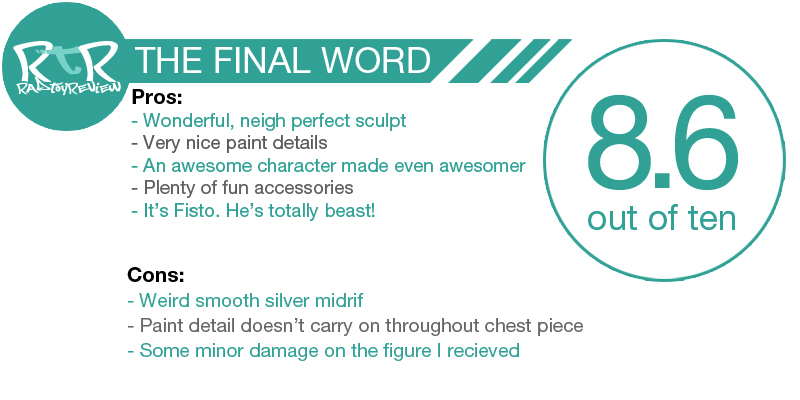 The most garish of these blemishes comes in the form of his smooth silver painted midriff, painfully viewable once you remove his armor. I just don’t get the reasoning for this. 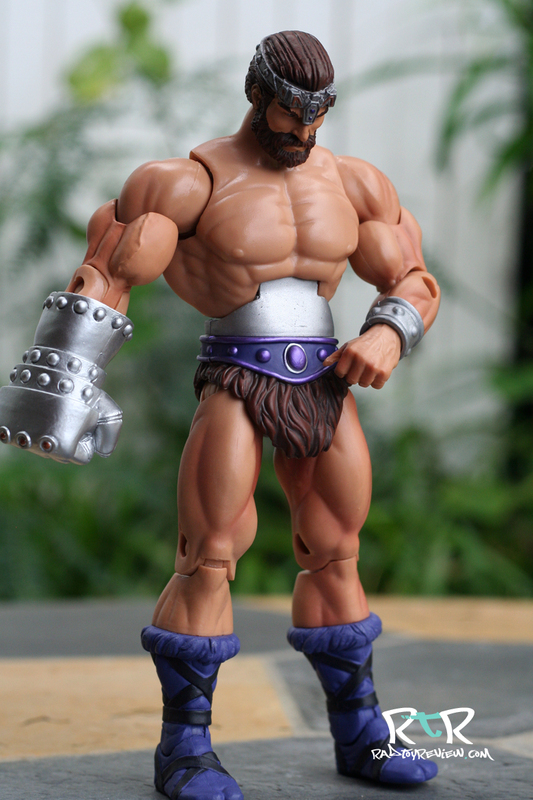 Was Mattel concerned about Fist’s armor coming across like a belly shirt or something? 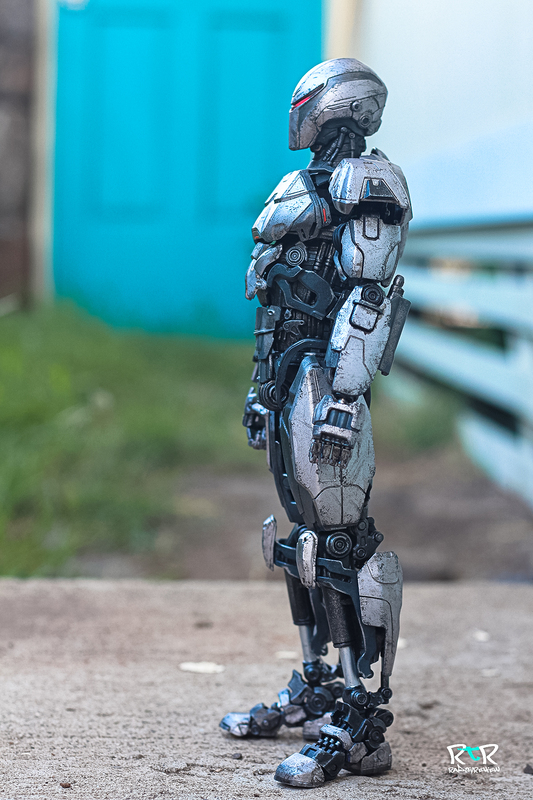 If you pose him in a certain stretched manner, I imagine if not for the silver coating there might have been a belly button peaking out but come on, this just looks silly. On top of the silver paint, it’s completely smooth as there’s also no sculpting to speak of either. 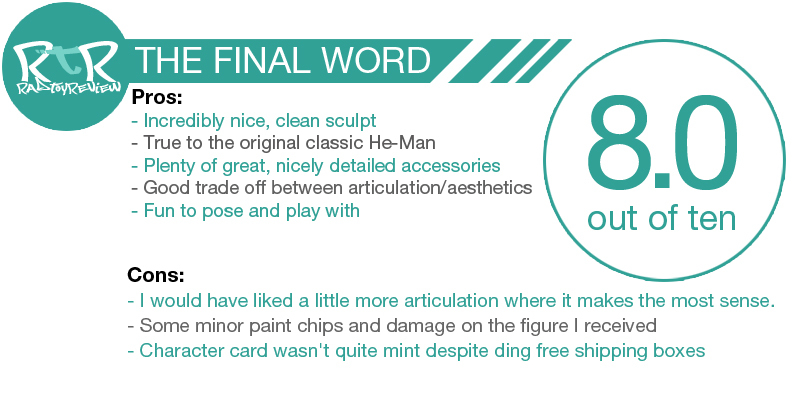 There are exactly two other small things that keeps my main man, Fisto from being perfectly executed. 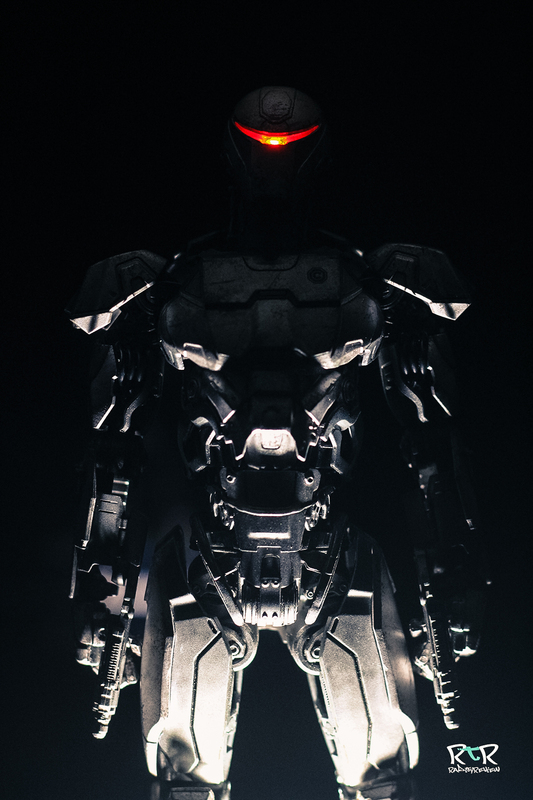 First, the paint detail on his chest piece does not carry on from front to back. For whatever reason (ran out of paint?) it ceases at the armor split. Yes it’s on his back, but believe it or not these are objects that we can turn and twist at will. It’s not really hidden. We can still see it. The second thing is more of a defect in my particular toy and may not carry on to yours. His sword hand has some mashed digits, as though they were pinched in a machine or clipped by nail clippers. It’s a small thing, possibly caused by during manufacturing but it still puts a bit of tarnish on his otherwise gold star. 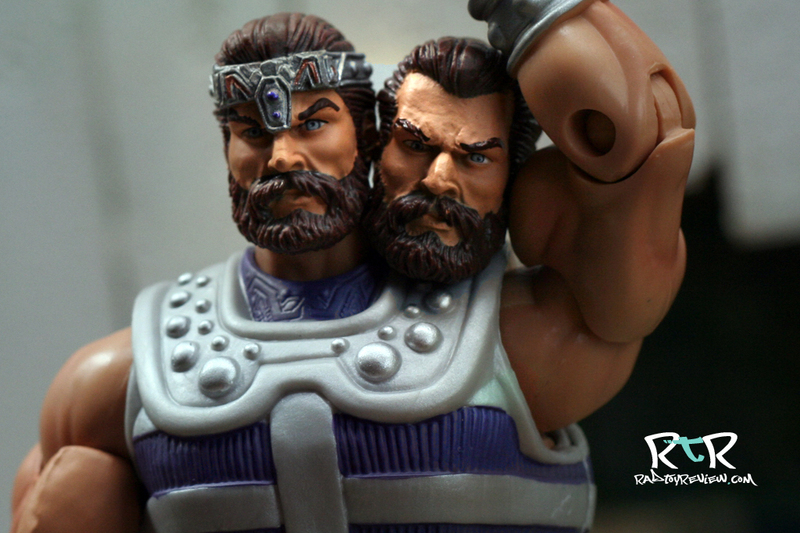 I wouldn’t have even mentioned it but so far I’m 3 for 3 on my MotU figures arriving with defects. All minor, but no less annoying when the cost and wait period is as high as it is. 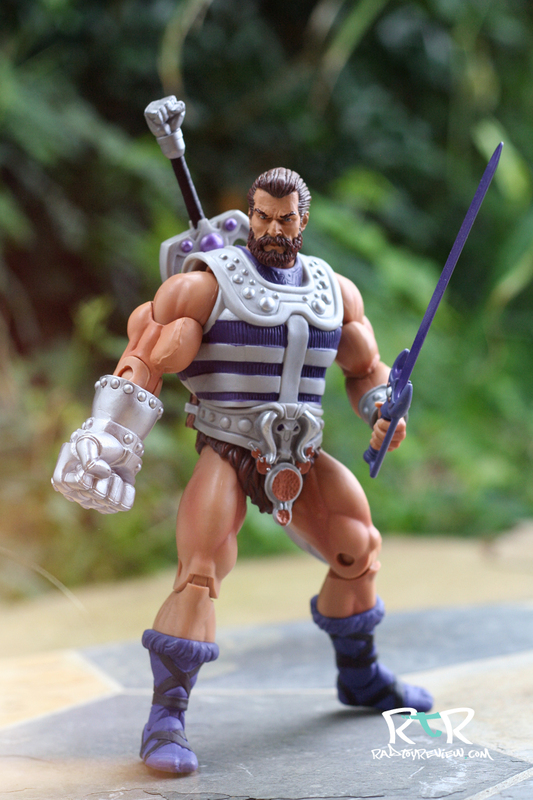 So regular head, belt, and chest armor on, big sword sheathed on his back, purple sword at the ready in his left hand and giant fist held menacingly so.. this is how Fisto shalt be presented in my house. 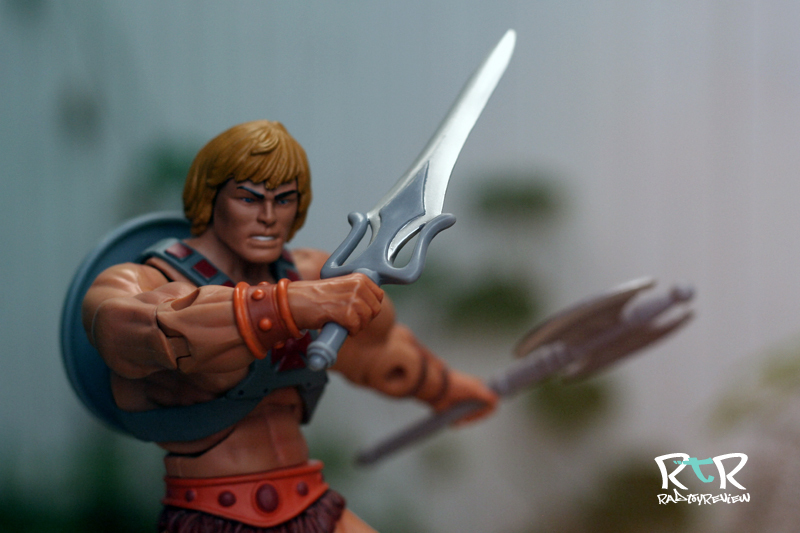 My short time with MotU Classics has already been really rewarding so far. I’m really digging these figures! 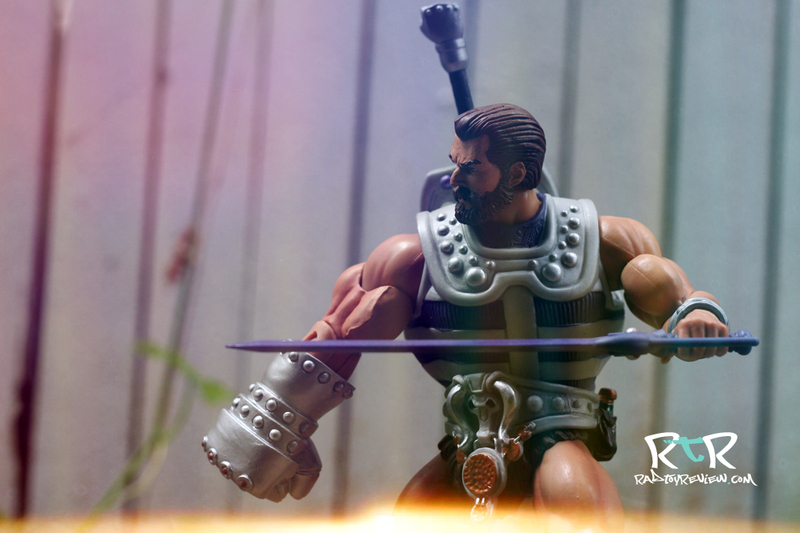 Fisto continues to reign as my favorite figure from this toyline. 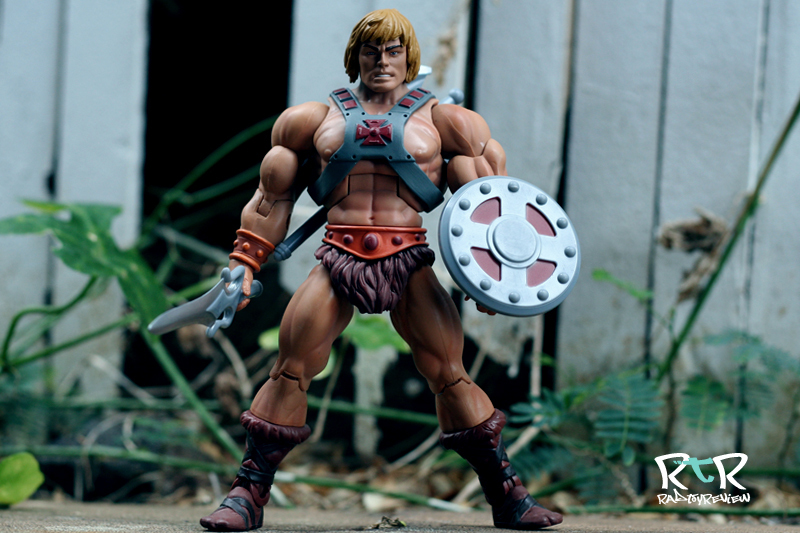 A few small issues keep him from being the perfect MotU figure in my eyes. 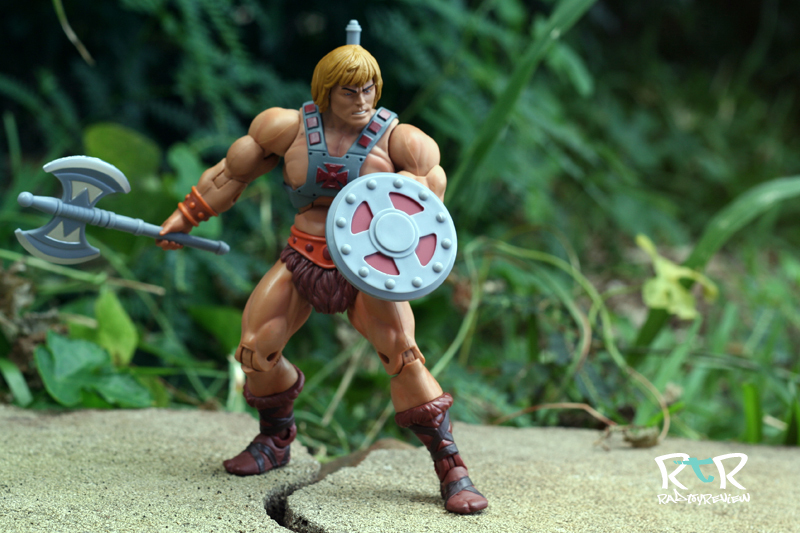 Mattel’s odd design choice in going with smooth silver at his midriff and the lack of the otherwise fantastic paint details carrying on throughout the character might cause you a small amount of emo, but I can promise that you’ll get over it.